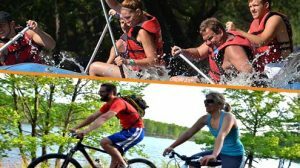 If you’re seeking a BIG adventure – Rafting, Biking and Hiking – then our BIG DAY OUT is definitely for you. Begin your day with a hearty breakfast to fuel you up at the Broken Paddle Bar & Grill. 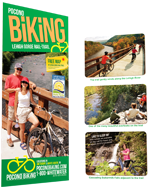 Following breakfast, you’ll embark on a 25 mile bike ride between the 1000 foot walls of the Lehigh Gorge Rail-Trail. At the famous Glen Onoko you will relax by the Lehigh River and enjoy your tasty box lunch. 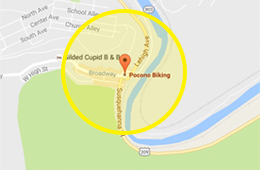 After lunch your BIG DAY OUT continues with a scenic exploration of an abandoned railroad tunnel and a hike to a beautiful overlook of the Lehigh River. You will descend back to the Lehigh River where whitewater rafts and equipment will be ready for your arrival. You will raft the final leg of your adventure! The Lehigh rolls and bends as you go whitewater rafting and navigate rapids past the ruins of 18th century dams, locks, and dwellings. Our friendly, well-trained guides will accompany you every step of the way. A delicious dinner and roaring bonfire at our Pocono Whitewater Adventure Center await your return. Your first victory drink (beer or soda) will be on us! Finally, your day is complete and you can hang out around the bonfire and brag that you survived Pocono Whitewater’s BIG DAY OUT! Private Big Day Out adventures are available to groups of 10 or more people, mid-week. Just give us a call at 1-800-WHITEWATER (1-800-944-8392) to arrange your private trip. Your photo is taken on the river and available for purchase in our store or online at PoconoWhitewaterPhotos.com. Have questions? Click here for additional Big Day Out Information or call 570-325-8430.